Nature’s Classroom: Do I Contradict Myself? My friend Mikkin belongs to a local Mothers of Preschoolers—MOPS—group. Last December she invited me to share on the role of holiday traditions can enhance your family. Well let’s just say I was memorable, but not because of my subject matter. I made an absolute fool of myself during Christmas Carol Charades. Screaming Away in a Manger!!!!!!!!!!!! was a small window into my competitive side. So, when Mikkin texted this summer asking if I would return and speak on how parents can help their kids with transitions, I lept at the chance to make a new impression. And since I wrote a book on transitions, maybe they would realize I was not a lunatic song screamer, but a calm rational adult. I did. But transitions are back on my radar. 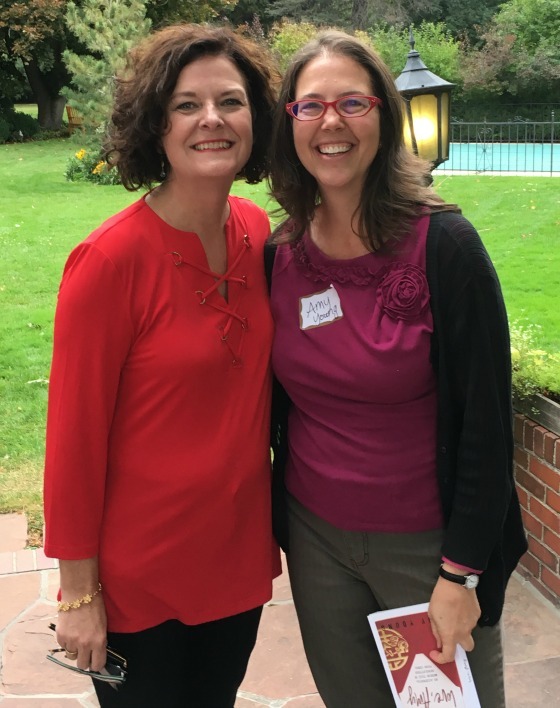 Saturday Shelly Miller, author of Rhythms of Rest: Finding the Spirit of Sabbath in a Busy World , spoke at an event in Denver. We had met on line when I first became a blogger, but we are now, “in the flesh” friends. During the event, she had us go outside and spend five minutes writing down what we heard and then five minutes writing down what we heard from God. I highly recommend you try it. Listening with your ears prepares your soul to listen to God. 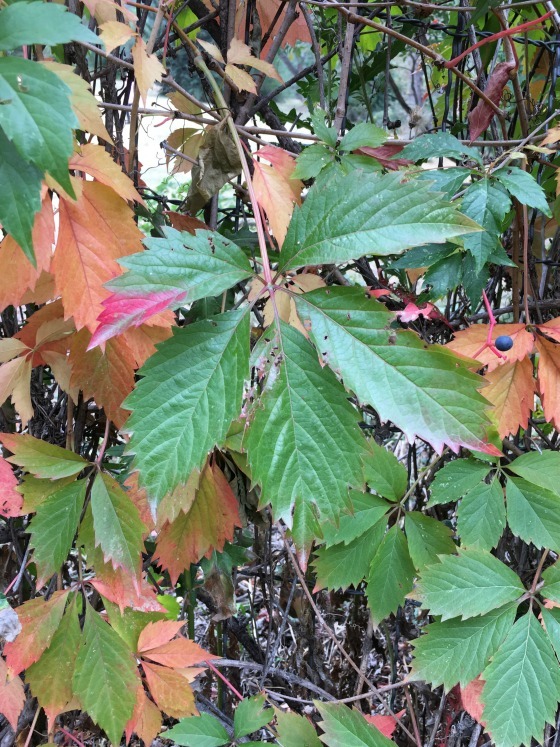 Unseasonably cold, I braved sitting outside and sat by bushes that were in the process of changing color.Take a moment and scroll through these pictures. Using the lens of transtions, what do you notice? Even within ourselves, we will transition at different paces. 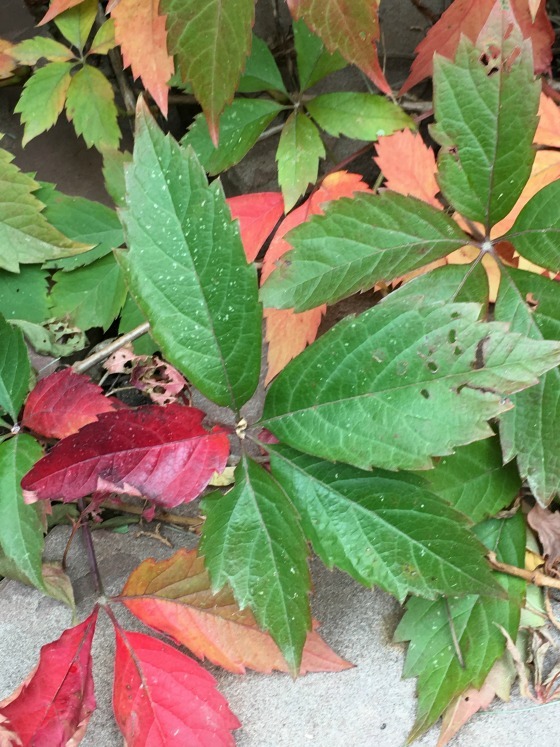 One leaf may be mostly green, but then the tip was bright red. 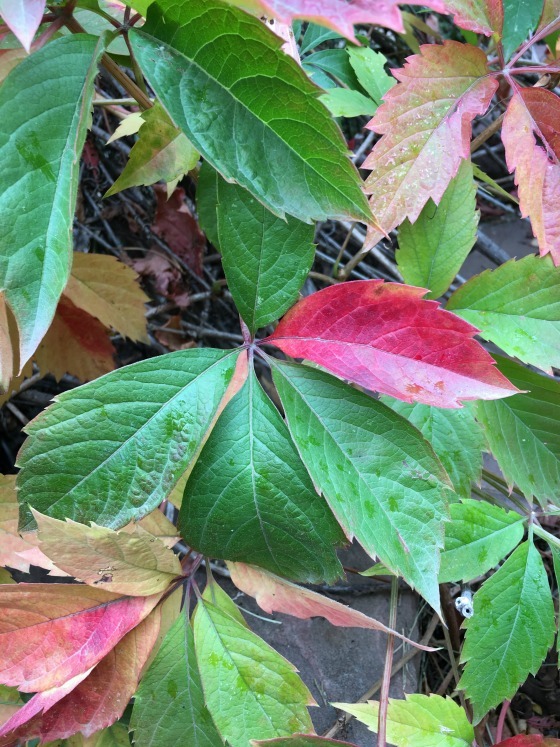 Another leaf was green except for one section. Or the leaf that the edge was red. Lessons from leaves. It’s true isn’t it? When I moved back to the U.S. I found my place at the gym before I found my vocational place. I felt at home cheering for the Broncos long before I felt at home in the church. Even now, parts of me are not the same color. 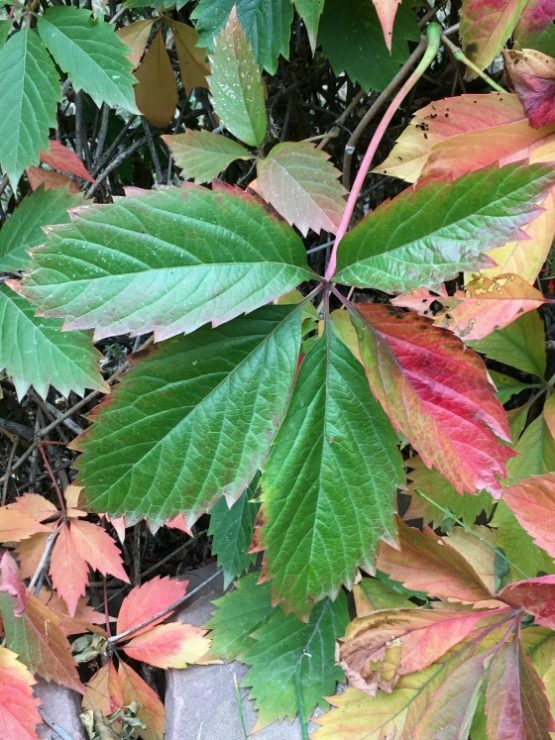 Yet like these leaves, maybe my own beauty is enhanced by allowing the seasons to be what they are. By seeing that one being can hold more than one story. And that God does not write binary stories. This or that. No, his specialty? The messy middle. You may wonder what a book cousin is. Come near and I will tell you a story. 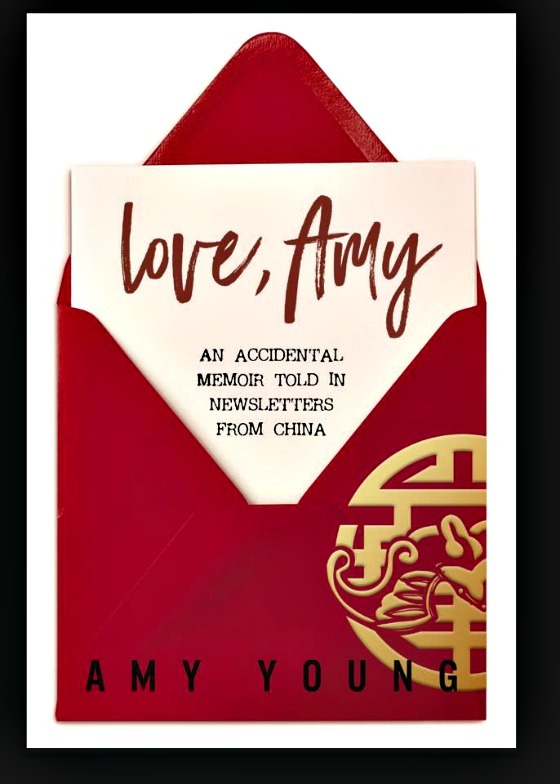 Once upon a time Amy and Joann worked for the same organization in China. As colleagues, they trained and then supported foreign English teachers scattered around China. But more than that, they were friends, good friends. One of them was destined to write a book and her name was Joann. One of them was destined to go through a mid-life crisis and thought that writing a book would be a brilliant career move because she was lacking in skills that the work force in America valued and she had grown accustomed to eating and heat in the winter and needed money and when she was crazed she was like a mama bear storming through life. And her name was Amy. But we are getting ahead of the story. Joann and Amy had a favorite neighborhood restaurant they nicknamed The Green Umbrella (GU for short). On the day they discovered it all of the outdoor tables had green umbrellas. Though the restaurant almost never had green umbrellas outside again, the name stuck. 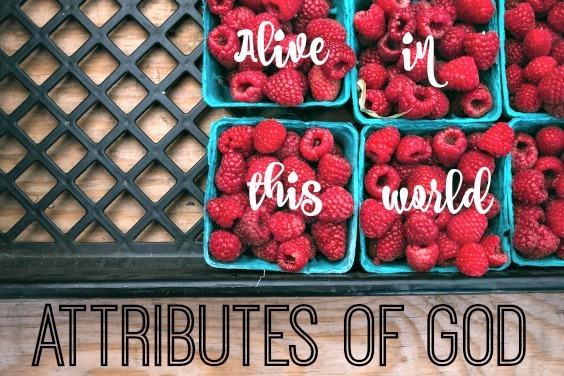 Joann unleashed a monster when she helped Amy set up a blog; in fact one of Amy’s earliest posts involves a conversation over green beans at GU and the unleashed monster and maybe a bit of Joann’s sighing at what she might have done to the world. The would often meet at the GU after a long work day or one of them returned from a work trip. Another evening Amy learned about hashtags as they munched on fried peanuts waiting for their Kung Pao Chicken. GU became a bit character in the story of their becoming authors. One spring Amy set out to write 500 words a day on her book. And she did. 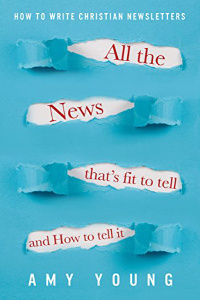 From mid-January until the end of April she wrote six days a week on what would become the backbone of Looming Transitions. That same year Joann traveled as a translator to Sichuan and when she returned, recounted discovering a church bell from—of all places—Coffeyville Kansas. Joann had called Amy while on the trip and told her about the bell, and the Kansas connection, and the indestructibleness of the church. But it was at GU while eating the deliciousness that poorly translates as family-style-tofu, that the full story came out. Weeks, then months passed. Over time, plates of green beans, peanuts, and spicy meat were consumed as Joann and Amy moaned and celebrated, each believing in the other’s book more than her own. Joann caught the “Bell Bug” as she called it. Having discovered one bell in Sichuan, she knew more must exist. And she was right. Always up for an adventure, Amy joined Joann as they hunted for bells in Shanghai, Qingdao, Harbin, Tianjin, and around Beijing. And then one day the GU was demolished in the name of progress. Unrelated to the destruction of a favorite restaurant, Joann boarded a plane and moved back to the U.S. Several months later, Amy followed suit. And time passed. And editors were hired. And cover designers were found. And slowly, slowly all those consumed peanuts and cups of tea brought forth life. 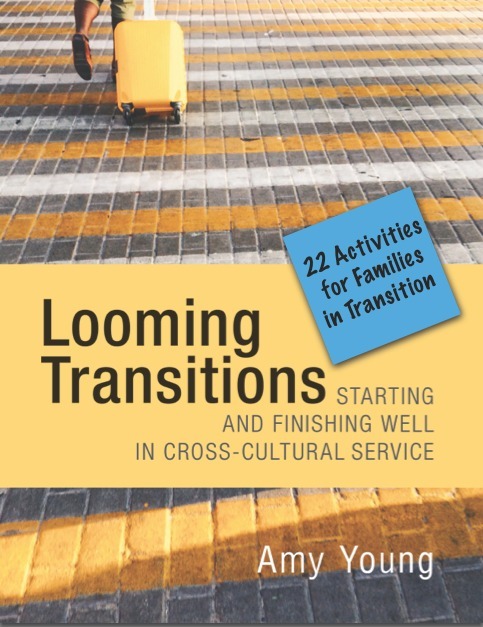 January 12, 2016 Amy announced the birth of Looming Transitions. Joann celebrated and was quick to text or email whenever she heard of someone reading her friend’s book. And then it was Joann’s turn. The editing done, the cover ready, the layout completed. Come close children, as I lower my voice with a dramatic pause—this is where our tale takes a turn befitting a movie. What day do you think The Bells Are Not Silent: Stories of Church Bells in China was shared with the world? January 12, 2017! I know, I know. Had I not seen it with my own eyes, I might find the timing a bit far fetched myself. But this is the true story of how The Bells and Looming Transitions came to be book cousins. I love The Bells Are Not Silent not only because I got to have a front row seat to the research and writing (and am mentioned in the book—keeping it real people), but because it highlights how God is at work all the time. We are the ones who forget to look or notice. When Joann discovered a 126-year-old bell hanging in a church in southwest China she knew that there was a story to tell. Who had decided to ship it? How had it been transported? How had it survived the political turmoil of the 1950s and 1960s? She also knew that if there was one bell, there must be others. Over the course of eight months she travelled around China looking for old church bells, finding ones from France, Germany, Russia, and the United States. This book is a collection of stories about those bells. But more importantly, they are stories of God’s faithfulness to his church in China. To those who have eyes to see, let them tune in to what is around them. Amen? Amen. Leave a comment sharing place you have seen God recently. Don’t overthink :)! 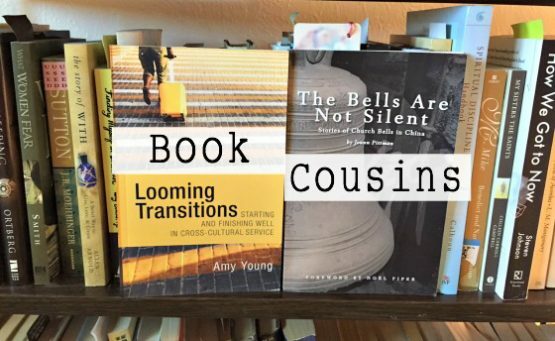 Just share and you’ll be entered to win a copy of The Bells Are Not Silent: Stories of Church Bells in China . 1. We live in a click-bait, hurry up world. Let’s go deep and then move on. The internet is wonderful—just consider how many different places this very post is being read right now while YOU are reading it?! Kind of mind-boggling, isn’t it? But in general it is geared towards noise and new information. This forms us unconsciously to have a false sense of urgency and move on to the next topic, post, crisis. It confuses our soul as to what is a urgent and what is important. I believe this is an important conversation to have. 2. I did not want to jump in too quickly with my thoughts, instead I wanted to create space for God to speak. If you haven’t had a chance to read through the comments on the original post at A Life Overseas, please do. They are rich and offer additional perspectives. 1. We need to have these conversations. The very enemy of our souls wants to isolate and through isolation whisper lies mixed with half-truths. In the whispering, we can become disoriented as to what is truth, what is half-truth, and what is lie. In community—and let me stress safe, healthy, trustworthy community—we do not have to bear burdens alone and we can sort out what is true in our situation and what is not. Allowing them to grow which can lead to greater isolation (see #1 above). 3. Too often we believe that we must pick between one emotion or the other. You don’t have to choose between joy and sorrow. You can have both. Guilt tries to manipulate you into one or the other, so that you don’t live an integrated life. We need to grow in our capacity to experience (and give permission to experience) more than one emotion at a time. 4. I am more and more convinced we need to lead the charge in a “culture of grief.” We, as Christians, should be the best darn grievers on the planet, and yet, too often we stink at it. I dedicated an entire chapter in Looming Transitions to grief. I now see that the need to weave grief into our lives runs deeper than I ever thought. Feelings of “fairness” and “guilt” can also be warnings for “an area to grieve.” Look for the loss. Are you loosing a friend? A location? Control? Someone who gets your jokes? The list could go on. 5. God is mysterious. I had a professor in seminary who cautioned us, as Christians, not to be too quick to cry “Mystery!” in the Christian faith. He instructed us to do the hard work of studying scripture, of asking theologians, of knowing history. But he also said, we needed to also remember that at the end of the day, studying, questioning, and knowing may not provide an answer and we will be left with mystery. Why do some get married and some don’t? Why do some spouses die and others don’t? Why do some struggle with this addiction but not that? Why do some children have problems that other children do not have? It may seem cheap to say it, but only God knows. And we have to live with that tension of the mysteriousness of God. Above all, God can be trusted with all of our emotions. If you are angry, you don’t need to hide it. If you are sad, you don’t need to “put on a happy face.” If you are excited, you don’t have to pretend you are not. If you are not at the same place emotionally as someone else you don’t have to fake that you are. But you do have to own it. You do have to offer it to God. You do need to find community to bear and process it with you. Trusting that in the offering, God is good, sovereign, mysterious and . . . at work. This is what I’ve been pondering. I’d love to hear from you. What have heard? What conversations with God and others have you had? I received an email from a young woman who had read Looming Transitions. Janice is a Canadian serving in Laos, but soon to leave as she is moving to France to marry her French fiancé. She wrote so beautifully about the tension singles can feel around marriage. I received permission to share this excerpt. “In this type of lifestyle, my roommate and I spend a lot of time together. We live together, we work together, we go to the market together, we go out visiting people together, we go on walks together, we pray together, we watch movies together, we read each other’s books. “Before I came to Laos I didn’t know her. However, we found we get along quite well. We have many overlapping interests and can talk about some personal subjects. I feel bad about not being there to help deal with challenges like money requests and electrical system issues. I also know that my leaving means that there will be periods of time where she is alone as the only expat. In the past there have been periods when I was alone in our town for weeks at a time. Despite having locals I was working with and visiting, and despite the fact that I am largely an introvert, I struggled with loneliness. I feel guilty about potentially putting her in the same situation, even though she doesn’t mind being alone here as much as I do. “Aside from this, is the fact that I am leaving to get married, which is where I feel the worst about the situation. My roommate really desires to be married. She is mid-30s, and has been in Laos for over seven years. So she is older than me, she’s been overseas longer than me, and she has probably been praying for a husband longer than me. “I know that God does not always do things in ways that seem obviously fair to us, but in this situation I feel the unfairness very deeply myself, and I can only imagine how it might feel from her perspective. In the past, she’s expressed her frustrations to me about how difficult it is to meet men while living here. And then I connected with this man, and now I‘m engaged. Everything about it just seems so unfair. And I know that there are many other single women like her serving overseas, because there are so many more of us than there are single men. “To be honest, this has been sort of a difficult area in my faith. Before I came to Laos it was a struggle for me personally; knowing that if I stayed overseas a long time, I might not marry. But I felt God leading me to go, and I went anyway. And I learned of so many others in the same boat as me, including my roommate. Now I am stepping out of the boat. I am so grateful to God for bringing my fiancé and me together, and I do not take our relationship for granted. But I find that even now I still feel the pain somehow, though in a different way. And I feel guilty. “I have found these feelings somewhat difficult to explain to people who haven’t been overseas and aren’t aware of the general situation. 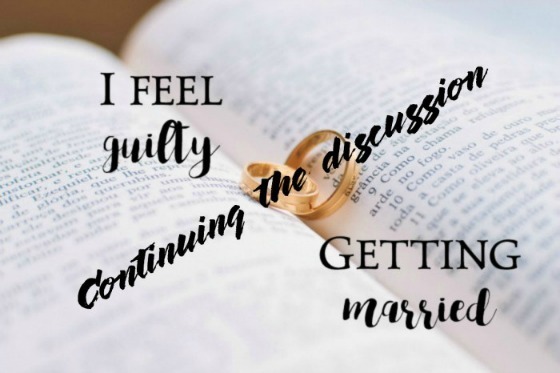 I have tried to talk about it with my fiancé. He is quite willing to listen, but I have found that if I get stuck on this topic with him too much, it is not beneficial. 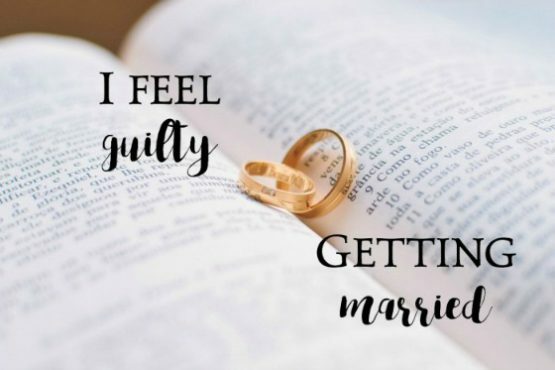 I don’t want it to sound like I feel bad that I’m marrying him, because that’s not what I mean to say. Right now some of my joy is buried beneath these other things. I keep hearing about people in Canada and France who are so happy for us. But I feel somehow removed from the happiness. How are you supposed to feel, when you know that what is a blessing in your life is the subject of such deep pain and disappointment to someone you love? “I’ve seen that my roommate has been having a difficult time with this over the past few weeks, since some hopes she’d had for a relationship recently fell through. In the past she has been really supportive of me when I’ve gone through difficult times, and I wish I could do or say more. It tears me up inside, to think of her feeling so hurt and disappointed. But I don’t know what to do besides listen, and tell her I’m sorry, and tell her I’m praying for her. And I do pray for her, and when I do, I feel very hopeful for her. I have tried to tell her this, but it’s not very specific, so I don’t really know if it’s helpful. What a gift to us, eh? The way Janice expressed all that is going on. Tomorrow I’ll share my thoughts. Where have you bumped into what may look like unfairness? 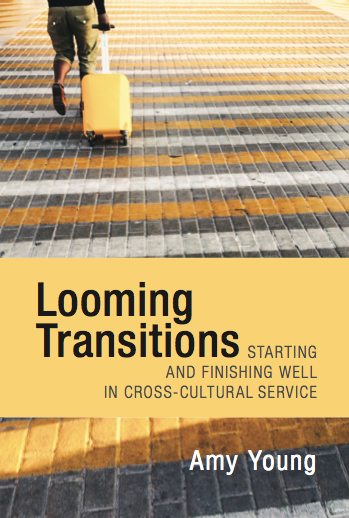 Can you believe a year ago today Looming Transitions: Starting and Finishing Well in Cross-Cultural Service made her debut? 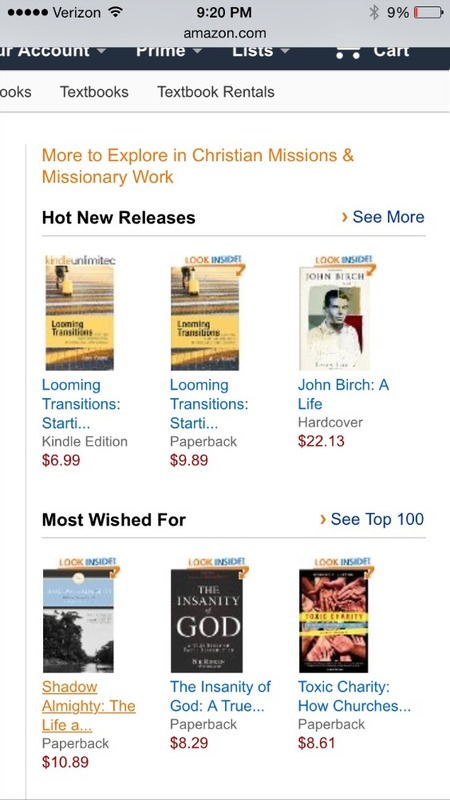 I planned to share the behind the scenes but could not have foreseen that Looming Transitions would be an Amazon bestseller. The surprises continued with a workbook and companion guide for families being created. And then I got another idea. Some people in transition do not have time to read a book. Some people want to be readers, but they just aren’t. Some people would prefer Looming Transitions to be in audio format. Okay, no problem. I’ve heard of Audible (as I bet have you. They sponsor a lot of podcasts :)). It turns out, and this is my interpretation, Audible is the mafia of audiobook publishing. I say this because they do not let authors set the price of audiobooks and force pricing to be between $15 and $25 a book. Hey, I’m a fan of books and paying authors a decent salary. But shorter books like LT are like Delaware against Texas in the House of Representatives. Of course people will tend to buy longer books to get more bang for their money. There has to be a better system. Using Gumroad, you can sell audio files where people can download them and listen via iTunes (or other methods) or Gumroad has their own app (both Android and Mac) that will play the audio book. I know!! So cool. So professional. So reasonably priced. I have a promotional page where you can buy it for $5, either for yourself or as a gift until January 20th. If you go to my Gumroad page, it will look like it is $10, so use the promo code and save $5. 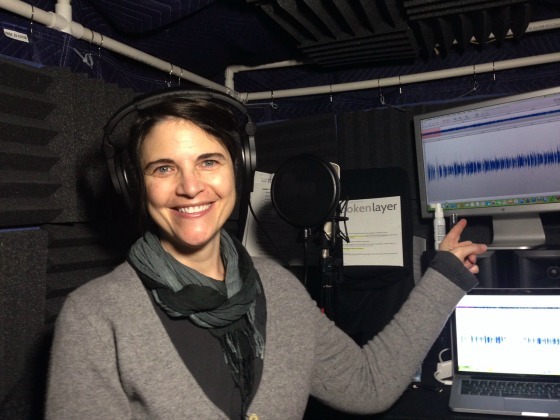 I love hearing “Behind the Scenes” stories and thought you might like to hear from the voiceover artist who recorded my book and learn a bit about the process. I am especially proud of her, because it is my sister Laura! 1. What’s your routine when you are going to record? Do you drink something hot? Do you sing scales? Do you say I love my family five times :)? I always have warm water with me and drink a lot while I’m recording. I also keep throat lozenges on hand and have a throat sprays in case my throat starts to get scratchy. But mainly it’s water, water, water. Not sure if you care about this part, the very first pre-recording preparation I do is actually thinking through what I’ll be eating or drinking before I’ll be recording. I avoid anything that will increase phlegm (mainly dairy, but there are others) and mouth clicks (coffee is the worst). Laura in her recording studio and that ladies and gentlemen is Chapter 1 of Looming Transitions :). 2. How long can you record until your voice needs a break? Being related to you, it was a unique project. In some instances it was a walk down memory lane, or I’d think, “Oh yeah, I’d forgotten that.” And in others l learned things about your experiences that I hadn’t know before, which was cool. It was also an interesting challenge knowing your voice (personality) so well, which comes through so clearly in your writing, and hoping my voice, which is quite different than yours, would do justice to your personal stories in particular. 4. What do you enjoy about being a voiceover artist? I really enjoy bringing words and stories to life. When I’m alone in my studio I get jazzed when I am reading something that just pops and sounds so alive and not just like words on a page. It’s fun to think through the characters in a book and bring their own voice to the story. And then when I’m in a recording studio with an engineer or others involved in a project, I love the collaborative creative experience. To do something one way and then try it a completely different way and see what happens. Someone may suggest something I never would have thought of, and then we’ll try it and it it may be great or it may flop, but it’s fun to be stretched like that. I also really enjoy the flexibility of largely working from home, that’s been great! 5. What might surprise people to know about being a voiceover artist? That it’s surprisingly hard! Sounding natural and conversational and not just like you’re reading words on a page isn’t easy. You’d think it would be, we all know how to talk. But when you’re suddenly in front of a microphone reading someone else’s words, it’s amazing how different that is to having a conversation with someone. 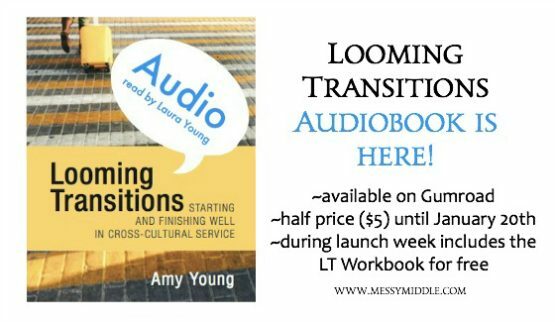 Laura, thanks for being the voice of Looming Transitions and working with me. For this project Here are a few of the reviews, you can read more here. Pray! Going outside of the mafia means it will be harder for people to stumble across the audiobook. But I know God will help get the word out through your prayers. Share this post or the news of the audiobook with someone who comes to mind as you read this. Use the promo code. Tuck away this information, maybe you don’t know anyone now, but you will. Rejoice! Let’s celebrate the fun of the past year and the ways God has used Looming Transitions. P.S. Authors, we’re in this together, eh?! I’m going to write a post about how you too can turn your book into an audiobook. It is much easier than expected. And if you need a voiceover talent . . . I can hook you up. Five years ago this week The Messy Middle . . .
was born and the angels rejoiced. Well, maybe not that big of a reception, but her birth did turn out to be more life changing for me than I would have guessed five years ago. 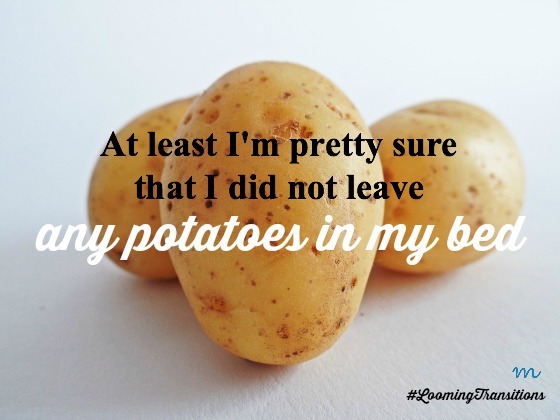 I entered blogging a bit like I was being dragged to a junior high dance by my friend Joann. “I promise you’ll like it! You’ll have fun!” She was a blogger and assured me I would love being one too. I wasn’t so sure, but after months of espousing the joys of blogging, I finally gave in. Funny thing is, all I needed was to be close enough to hear the music coming out of the proverbial gym full of sweaty, nervous bodies for my toe to start tapping and I was off, racing to the center of the dance floor. This announcement should come as no surprise: I love blogging!!! Five years allows for enough of a track record to reflect on the journey thus far; the ups and downs, the heartaches and joys; the new friends and friendships that never quite took off. For a different project, I have been going back through the 564 published posts and cleaning up broken coding. It is as much fun as it sounds, which is not much. But, it has given me a chance to review the past five years. Only thing missing? The Kansas Jayhawks winning the NCAA Basketball Championship! Too much heartache boys, too much. :). Overall, yup, the messy middle of life. 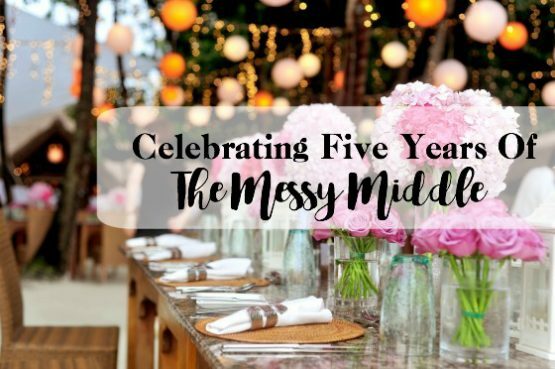 I know you have had your own “messy middle” the last five years too! 2. On the technical side, I have grown in my understanding of blog paragraph spacing, how to use images, coding, and other behind-the-scenes aspects of running a web-site. I have also learned that I use far too many pronouns (assuming due to the context what I am writing about is clear; hello, everyone work on your mind reading! ), WAY overuse the word “all” (I’m an includer, don’t we all want to be included? ), and have learned that “that” can be annoyingly over used! Sorry :). Still in process myself! 3. Blogging has allowed me to stay in contact with people—both those I’ve met in person throughout life, those I’ve met on line and hope to meet in person, and you who I’ve met here at The Messy Middle. I had not foreseen that starting a blog was a bit like building a cyber home base. In many ways, blogging has been a virtual version of my life for many years in China. I had a home base in Beijing, but much of my job involved traveling around and visiting teachers. The Messy Middle is now a major home base for me as I travel around to other’s blogs, as I guest post, as I contribute to other sites. But this is my home. I am glad to be easily found here and maintain friendships. 4. Guess what else I had not realized until I reflected on the last five years? Unaware to my conscious mind, I have re-created my US/China life, meaning there are two separate, but equally important to me, spaces. Maybe this is the only way I know how to do life :). I have two cyber homes now, and both are very dear to me. Both are where I am my true self. The Messy Middle and Velvet Ashes flow in and through and out of me. I cannot imagine my life without them. 5. Blogging is like any other relationship. For me, blogging is 80% of the time fun and I love it. But I will admit that about 20% of the time, I blog out of the discipline of this relationship. Honestly? 20% cost for 80% joy? Not bad ratios! 6. One major shift in the last five years is that this used to be the only place I blogged. I can still feel the shiver of joy when Amy Sullivan contacted me asking if I’d write a guest post. And then David Rupert asked, and Tanya Marlow asked. 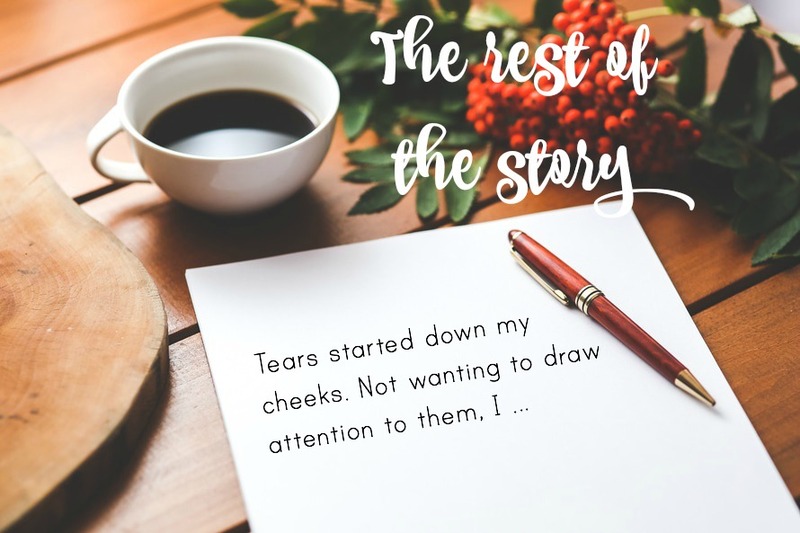 By then I also submitted guest posts (and was rejected lots, just so you don’t think this is all rainbows and touchdowns!). I am here slightly less, but I’m writing more than ever. Seriously, don’t you almost get chills to think of how we have changed the discussion in these areas? When I look at the problems of our world today, I can downplay any one of these and wondering if I’m, if we are, doing enough. But how did Jesus feed the masses? He tore bread and fish and handed them to those near him and asked them to help distribute and the people were fed. Jesus feeds the masses one person at a time and collectively, they are fed. I dashed off a letter to Pastors and went to lunch to eat yummy green beans. You shared and shared and shared on Facebook. The Mother’s Day letter has been read in every country on the planet, it has been turned into liturgy and made into videos. But more than that, it has given language to the deep parts and validated them. The conversation is forever changed. People have been fed. The boys? The boys of the world still get to me, but that too is changing. The post with ideas for packing boys boxes gets hits every single day. Already today 25 people have read it. In the last seven days 308 have gotten ideas and feel equipped to help the boys ages 10-14. These boys are fed because quite a few of you pinned the post on Pinterest. We still have a lot to do :) . . . but boys are fed when they are seen. Boys souls feel their worth when they open a box packed with them in mind. So much beauty in our world that goes unnoticed. But less so by us. We are in the midst of the messy middle of our lives, yet now we know it is possible to be #DistractedByBeauty. (You are using Instagram and Facebook to spread the word!). 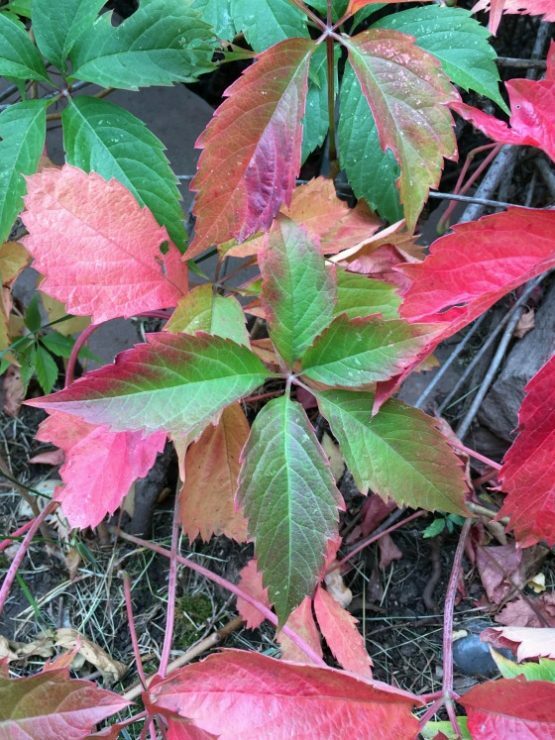 I love all the beauty we are seeing! Five years, eh? I remember being shocked when I started The Messy Middle and after a week only have 42 people subscribed. (In fairness to me, I knew tons of people from all my years in China, it is not only that at times I think too highly of myself.) Five years ago I thought a blog was about words. It is. Of course it is, but that is a bit like saying a book is about letters. Or a movie about still shots. Or a party about the cake. I am grateful you are here and together we can support each other through the highs and lows of life. I’m thankful that God holds grace and truth in tension and invites us into the messy middle of his wonderful world. Transitions contain “self-contradictory statements, which can only be true if it is false, and vice versa.” In other words, transitions are ripe with paradoxes. 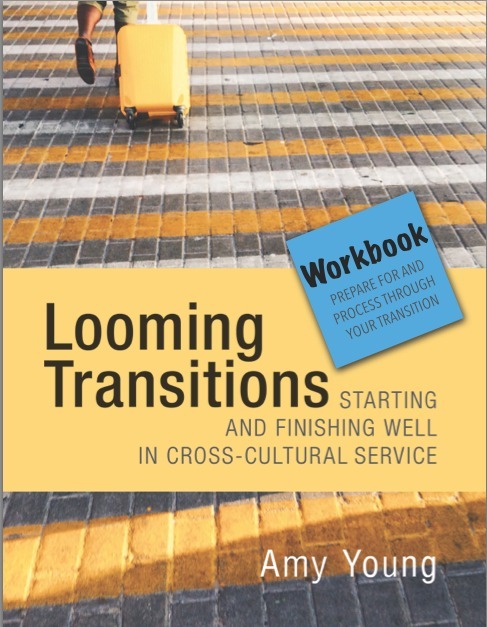 I received the following in an email after reading Looming Transitions: Starting and Finishing Well in Cross-Cultural Service . Isn’t that the best? I know a bit about her transition, and people it was AGONIZING. The fact that the didn’t leave potatoes, I’m telling you, is victory! Which transition paradoxes you have experienced? 1. You have to change to stay you. 2. Grief is the exhausting path to life. 3. Others have gone before, but no one has walked your path. 4. You might say ridiculous things that are true. 5. A fertile soul may be tilled with to-do lists and watered in tears. 6. The stretch marks may not be obvious to others, but your soul knows the stories they hold. 7. Pay attention to the little things because you never know what will end up being big. “This is an incredible book. I read it as I was transitioning home from the mission field, but wish I would have read it before I left AND when I was coming back. 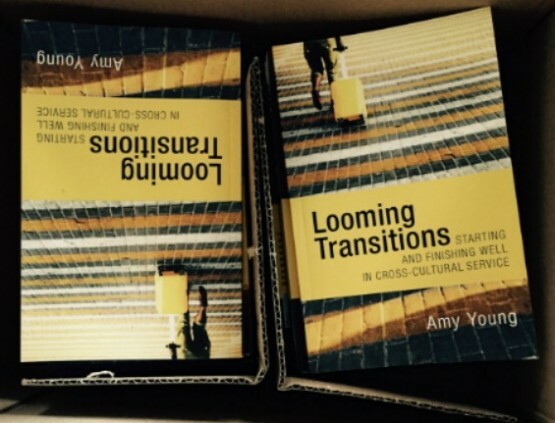 Amy has done a beautiful job at looking holistically at the issues presented in the fragility of transition. Her words are instructive, wise, vulnerable, helpful, and full of grace. Thanks for sharing in the joy of helping so many to transition better than they would on their own. In the midst of change what are you tethered to? Velvet Ashes is having a three-week series on Change, Re-entry, and Carrying on. Regardless of which over-arching category you are in, we can’t face it without the Triune God. We need him as we change. We need him as we re-enter. We need him as we carry on. We need him. I wrote the following as the final post of our week on Change. It’s the one thing that unites us. People are fairly surprised when they hear that my first five years on the field I had a total of two teammates. One thousand eight hundred twenty five days and only two teammates, one for two years and one for three. But then I moved into a much larger community and my life kicked it into hyper gear with never a year (sometimes even a semester) where there wasn’t someone coming or going. Leaving permanently. Here for a year. Off to language school. Called to a new assignment. Need to transition a child to college. Time for a furlough or home assignment. Check, check, screaming at the amount of change, check. Last week I was at a dinner event where the speaker asked each of us at our individual tables to share where we have experienced generosity in the last year. A teacher had a mentor teacher help her. The founder of Azmera shared how God had opened door after door for their retreats. One woman had a quiet member of her small group initiate a supper club and do all of the cooking. Another person shared how in the last 18 months she has lost both parents and her sister and she has decided to be generous with herself and the grieving process. Change might be our one constant, that’s true. But God is the One who is the same yesterday, today, and tomorrow. When you are in seasons of great change, it helps to be tethered to The One Who Does Not Change. Tethered means you will still feel the pull and being jostled, and while you might feel adrift, that is not the big-picture reality. Let’s picture ourselves around a dinner table. There is a crusty loaf of bread in the middle, ready for us to tear pieces off as we break bread together. There is a bowl with little pieces of paper and you draw one out and share how you have experienced that attribute in the last year. Because stories give birth to stories, if someone sharing on an attribute stirs something in you, go ahead and share. We’re among friends. And sometimes you need to hear other’s stories to remind yourself that what unties us isn’t change. Tell a story about someone being generous with you. Tell a story of where you really felt alive this year. Tell a story of when you experienced someone being aware of you and your needs. Tell of how you have been provided for. Tell of when you tasted mercy or joy or forgiveness. Tell us about when you felt able this year. Tear off another corner of bread and share. Because as you share, we see God at work. We taste his presence. We are sustained for the next leg of the journey. And if you have another story to share, do. We can never have too many stories. We’ve got all evening. Come, share. I said I wan’t going to become one of those people who work their book into every conversation. 1. In the search bar, if you type “Looming” and hit return before adding “Transition” . . . you’ll be directed to a lovely Looming Kit. 2. When you do correctly type the name of Looming Transitions, you’ll see it’s climbed to in the #20’s in one subcategory :). 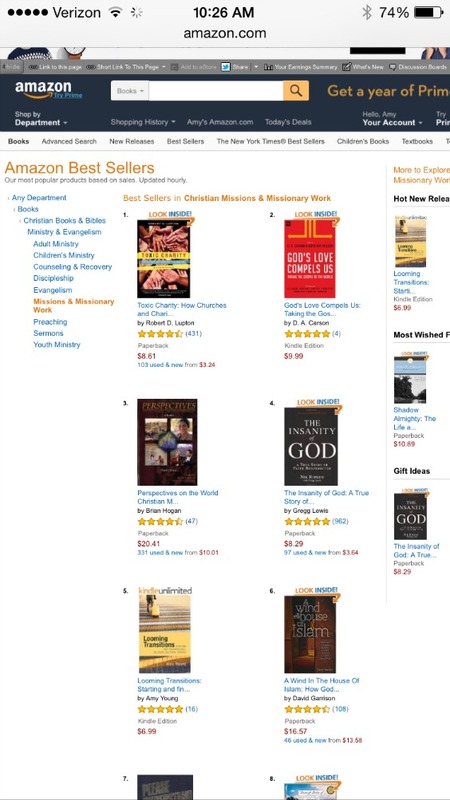 Looming Transitions is #5 on a best selling list!!! 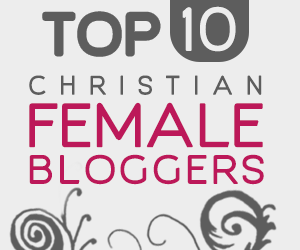 I was ranked in two subcategories, #5 in one and #6 in in the other. You can see them here and here — the rank varies, so it’s doubtful I’m still at exactly #5 and #6.. I have to say, part of me wants to put a bunch of disqualifiers with the main one being: this isn’t a “real” best selling list because it is a sub-list. However, I’m not going to do that. Because that diminishes what you have done for me and what God has done through this process. As part of the book launch, I had a post at A Life Overseas, where I’m a monthly contributor, and I offered copies of the book in a drawing. Two overriding emotions on Saturday as I replied to nearly 55 comments: 1. The amount of comments (the need for these resources is so great!) was heavy. 2. Someone I don’t know said he was already part way through the book and it was valuable and humorous. Surreal. All of it. I don’t know him, he isn’t someone who loves me and has to buy out of semi-obligation. Valuable. Humorous. Wow. God is using something I invested so much time and effort in beyond what I dared dream. If I could, I’d thank each one of you who has bought it, posted on social media, emailed me, offered to let me post at your blog, and written reviews, I would. But how do you thank an army fueled by love? 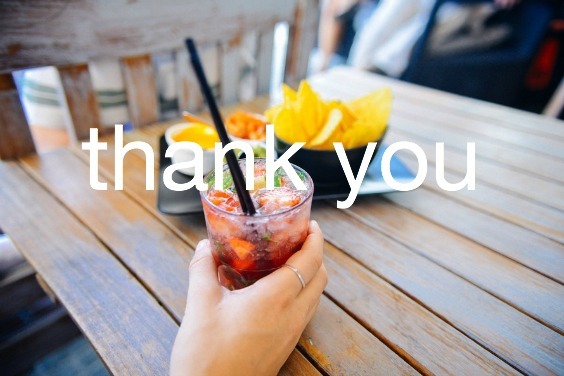 The only words out of my mouth for the rest of my days would be “thank you” and I wouldn’t hit everyone. I don’t know how to thank you. So I will simply say, thank you. I would like to promise, promise, promise that the next post won’t be about the book (I have four posts all ready and none of them are about the book); however, if Oprah contacts me between now and Thursday, you’ll hear about it. Doubtful, but after the last week I’ve had, it’s fun to dream, isn’t it? The story of Looming Transitions is a bit like riding a merry-go-round. I’m not sure where to get on because there is no clear starting point. I’ll narrow the beginning to three stone markers on the journey. I was asked to lead a half-day workshop and given the title “Finishing Well.” It was for teachers in their last semester teaching in Asia. I brainstormed a list that has become the body of Looming Transitions. Multiple people had said, “Write a book.” But when Jim Walters said, “You need to write a book” it was not him speaking but God. He gave me two pieces of advice: write 500 words a day and try to get an agent. Those were my marching orders and I started marching. In a notebook I recorded how many words I wrote every day until it was done. So I started reading a ton about writing, making friends through blogging (Hi Amy. Hi Tanya. Hi Mary. Hi Ed. ), and driving my friend Joann nuts over my obsession with numbers and writing rough drafts and many other charming parts of my personality. More than once she said, “What have I unleashed? !” That’s how charming I was, she said it out loud. Imagine what was going on in her head?! I finished the rough draft about five months after I started it and thought the hard part was done. More angelic laughter. We really can be a riot. I then sought to implement part two of the plan to financial freedom: get an agent. I won’t bore you with the details, but the normal path involves getting an agent first and then writing a book. #Oopsies. Oh well, rules were made to be broken, right? So, I contacted many agents and heard back from maybe one or two, most never replied. The basic problem was that I didn’t have a large enough platform to sell books. By this point I was living in the US and had continued with my reading and studying the craft of writing. I also was no clearer on “what I was going to be when I grew up.” Velvet Ashes started and I was delighted to be a part of it, assuming at some point I’d have to cut back once God opened some doors. Around this time I heard of an editor who was just starting and had low rates for editing. I hired her and learned one of my bias was hindering me. Big time. I’m sure you’re familiar with Boundaries by Cloud and Townsend or The Five Love Languages by Gary Chapman. I love both, but the gabillions books they have spawned drive me nuts. Boundaries For Left Handed People, The Five Love Languages Before 5 p.m., Boundaries With Idiots, The Five Love Language for the Less Lovable. Good grief!!! Can you not just write one book? Well, it turns out, not if you don’t want to sound schizophrenic and all over the board and confuse people. My first draft was about transitions in general. Transitions to and from the mission field. Transitions for parents who have a child graduate from high school. Transitions to a new city. I’m sure you’re getting a picture of how out of control and all over it was. I’d also learned that many authors don’t have their first few books actually published; those drafts end up being writing practice. Which sounds reasonable, so I put my sprawling rough draft away and truly had such peace and gratitude for what I’d learned. Velvet Ashes turned out to be not a side gig, but a beautiful life giving next step. (Angelic cheering.) More time passed and through VA I met many people wonderful people. Can I tell you the holy release I felt? A gift is so much lighter to carry and steward than a ticket to freedom. A gift can be talked about and shared because in so many ways, it’s not about me, it’s about the recipient. A ticket to freedom has a smarmy-car-saleman persona because of where you need it to take you. This last leg of the journey started about a year ago. I took that schizophrenic draft and rewrote it, narrowing it from all of life’s transition to one very specific one. And the rest, as they say, is history. In the last year I met another editor (Deb Hall) who is a miracle worker, Kay Bruner lead me down the self-publishing pathway, Theresa responded to a FB call for editing help and became a friend, Christy made the most amazing cover, and Andy Bruner is a formatting genius. And then I reworked it two more times. Many of you have cheered and rejoiced and reminded me that transitions are so much easier when we don’t make them alone. Thank you thank you. Since life is often like a merry-go-round, ready for another spin? :)! P.S. Winner of Looming Transitions has been notified. But the party’s not over yet. Give aways on Velvet Ashes Instagram next week and A Life Overseas this weekend. You’re invited to join either :)! What do you focus on when you are afraid?